The Chorley star faces Ohara Davies when the British super-lightweight rivals headline at the Morningside Arena in Leicester on Saturday night. In some ways the 25-year-old will be in new territory as the main attraction live on BT Sport. But with newly-crowned trainer of the year Jamie Moore in his corner, Catterall has been training alongside fighters such as Carl Frampton, Rocky Fielding and Martin Murray all of whom have been to the very top of the sport. “I did actually headline a local show in Bolton which was great with loads of local support,” said Catterall. “But this is a bigger show, live on BT Sport. “I know what’s coming though.I’ve been in these situations, I’ve walked to the ring with Carl. “It’s not me fighting but I’ve been in the dressing rooms for big fights, I’ve seen and experienced it. “I’ve been through their journey in the gym, how they prepare mentally and physically for the fights. “I just picking up little bits off everybody and adding it to my own game. “Boxing can be a lonely sport at times. 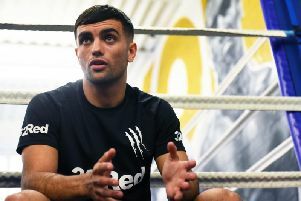 It will be Catterall’s fourth fight under Moore and his co-trainer Nigel Travis, two first-round victories coming before a points win over home favourite Tyrone McKenna in Belfast in June. “It’s been a busy year,” said the unbeaten former British champion. “I only had a week or so off after the Tyrone McKenna fight and was straight back in the gym for this one. “I like being busy, I’ve kept active and it’s put me in position for this fight. “The lads are brilliant. The atmosphere is great and everyone is pushing each other. “I’m learning every day and I couldn’t be in a better place.